What we stamped at January Jamboree! I just LOVE, LOVE, LOVE the new products in the Stampin' Up! Occasions Mini Catalog and the Sale-A-Bration brochure, don't you? and a Birthday all-in-one treat box! Notice the new Scallop Trim Border Punch (118402)? This is one of the FREE products you can get right now during our Sale-A-Bration event with an order of at least $50! There is also a matching corner punch too! (available for purchase in Occasion Mini Catalog) Don't you just love the silk ribbons? and now they come in different colors! Here is the same card showing the scallop punch used on the top and on the side. Which do you prefer? This card also utilized the Big Shot die cut machine, and Polka Dot background (hard to see), the new Extra Large Fancy Flower punch, Sending Love Specialty Designer Series Papers! Isn't this so bright and cheerful? I could have used hearts, but just had to try the new floral punch! The new Mini Milk Carton Die used with the Big Shot Machine is SO adorable! Here it is featured with the NEW Vintage Vogue stamp set, Sending Love Specialty DS papers and a rhinestone brad and grosgrain ribbon to finish it off! So many great NEW products! The last project was this pretty Birthday box showing both sides of the designer papers, and using different bow designs and button colors. Can't really tell from the photo, but the Specialty paper is glittered! Oh, so chic! Here the box is opened-the lid is attached-VERY cool! Fill it with Hersey's kisses or whatever you like, and it's the perfect gift for a Birthday--or Valentine's Day! So--don't you wish you came to January Jamboree? I'd love to hear what you think of these projects...and all the wonderful new products Stampin' Up! came out with! or, visit my website to view events and to shop for any of these products 24-7! With only a few days to spare before Halloween, I can finally share this adorable little halloween basket I made with the Sizzix Big Shot Baskets & Blooms Die! I had so much leftover Creepy Crawly Designer Series Papers from last year (I LOVE this paper) that I decided to use some of it for this project. The stamp set-Batty for You, is a carryover from last year and I just love this little set too...so I was thrilled to be able to continue using it this Halloween for my projects! If you have any baskets you have made with this die, I'd love to see them! It's GREAT to be back to blogging again! I've missed you! I welcome your comments! Boatload of Love Box in the Bag-a downline gift! I really enjoy making these Box in a Bag projects (and this is what it is called, because there really IS a box in the bottom of the bag-see the photo below as proof!). To learn more about these, read THIS POST. Here is another one I made as a gift (shhhhhhh!) for Jan (one of my first level downline) who has been an inspiring leader to her team, a supportive downline member, and most importantly-a dear friend for many years. I hope she doesn't see this before she receives it in the mail! Even if she does, what's IN it will still be a surprise (so I'm not telling you what I'm putting in it!) I'd love to hear your suggestions though! The boat is watercolored with Aqua Painters and Classic Ink Pads on Watercolor Paper, then cut out and added above the scalloped edged bottom. The boat, life rings and anchor are all stamped again, tediously cut out and raised with Stampin' Dimensionals and Crystal Effects for a fun 3-D effect. The clouds are stamped in White Craft ink and embossed. I painted the chipboard letters with white acrylic paint, then used the aqua painter and reinkers to color them blue. The Life rings, anchor and clouds as well as the On Board Lots of Letters Chipboard are all finished off with Crystal Effects to make them "pop". I used Textured Wild Wasabi Cardstock and the Round Tab punch, then added eyelets with the Crop-o-dile and looped (retired) Bella Fancy Fibers loosely thru them, knotting them at the ends. I decided to made the nautical knot with roping (instead of using ribbon) to add to the seafaring touch! I am pleased with how this project it turned out! So--what do you think? I truly had so much fun making this..I should have made two! As difficult as it will be to give this one-of-a-kind creation away, it was made with love, for someone I admire who is very deserving of special recognition-in case Jan doesn't realize it, she has been a loyal, caring friend and I just want her to know how much I have appreciated our friendship over the years. To view all Stampin' Up! products used in this project, visit the Stampin' Up! ONLINE CATALOG. Just click on the photo link on the left sidebar. Fortunately for me, the Boatload of Love stamp set is NOT on the retirement list!!! It's a great set! I'd love to hear your comments...don't forget my BLOG CANDY posted awhile ago will EXPIRE at midnight on June 29! Follow the instructions in THIS POST to be in the drawing to win this awesome Stampin' Up! candy I'm giving away at 9:00 a.m. EST on JUNE 30! Here's my Box in a Bag for a Birthday Gift! When I saw these, I knew I had to give it a try and make one! NOTE ADDED NOVEMBER 2 2008: I just learned that the credit for the Box in a Bag creation actually goes to one of my INKredible Impressions (my upline Tina's Stampin' Up! group) friends from Arizona-none other than Diana Gibbs, an awesome stamping gal! Diana won a contest with Stampin' Up! for this creation! She wrote a terrific tutorial which you can find HERE. Pat, a good friend of mine, had a birthday last week, so I thought this was an adorable way to package up a gift! Paula asked that we share our creations, so I will be sending mine to her. I noticed others have already sent her some and she has posted them on her site here. You can find the tutorial here. Do you know which punch was used to make the scalloped base? The Slit punch! It's really very cool! Now it's YOUR turn! Give it a try! I'd love to see YOUR creations! Send me your photos and I'll showcase yours here! Or leave a link here in the comment section when you make your own! I wanted to use some Designer Series papers I haven't done much with (before it ends up on the retired accessories list!) 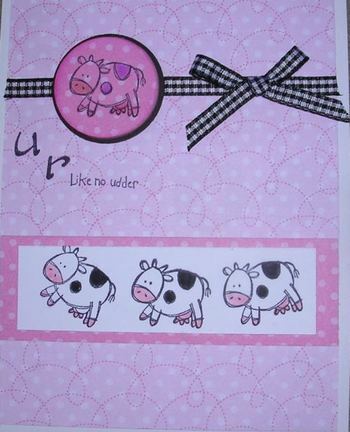 Here's a simple page I came up with for a Stampin' Up! workshop, using the Cutie Pie paper. I love embellisments, so this time I combined the Boho Blossoms punch and cardstock, with the Flower Fusion and a brad for the floral embellishment. To make the Rose Red corners where the photo goes, I used the Photo Corners punch and layered these UNDER the top So Saffron piece, instead of on top-for a different look! Is scrapbooking something you would love to try, but you are intimidated and get lost when you look at all the myriads of scrapbooking papers, embellishments, gizmos and gadgets available out there and it appears you need it all to complete the task? It may surprise you, but you can make beautiful pages that are quick and easy to produce without alot of fuss-with Stampin' Up! 's Simply Scrappin'® kits! Each kit provides 12x12 cardstock and pages of images which are self-adhesive die-cuts-many of which coordinate with matching stamp sets! Each kit also comes with several terrific layout ideas, so to create the scrapbook pages, just cut, copy and add your own photos! You can finish complete albums using these kits, in just a few hours! 1. Adhere dotted Summer Days Designer Series paper (2" x 6") to Bashful Blue textured page. 2. Adhere photo to Real Red textured card stock (4-1/2" x 4-1/2"). Adhere self-adhesive die cut border from Summer Days Simply Scrappin’ to textured card stock. Adhere to page. 3. 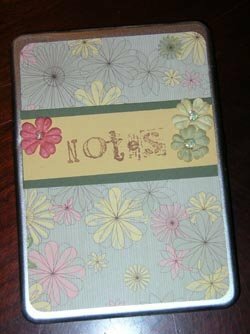 Adhere “Lazy summer days” self-adhesive die cut to page using Stampin’ Dimensionals. 4. Layer Pumpkin Pie, Real Red, and Bashful Blue die cuts using Stampin’ Dimensionals. Adhere to page. Now that you are feeling much more confident, when you are ready to be more creative and spruce up your pages, you can add other little products and embellishments such as colored or Rhinestone Brads or Eyelets (page 189), Buttons or Beads (page 192), Flowers & Pearls (Pretties Kit) or Hodgepodge Hardware (page 188) or Ribbon and bows (190-191). If you want to make a complete album, these can be found in Linen or Leather on page 176, along with page protectors. Please let me know in the comment section after this post, if you want me to provide more scrapbooking ideas and posts in the future. Would you be interested in purchasing ready made kits with pages, instructions, supplies and photos to make a complete scrapbook-by mail? 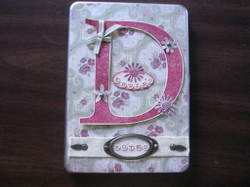 There are many techniques and ways to embellish not only scrapbook pages, but cards, and other items to make your own home decor, garden decor, fashion statements and so on. But-I don't want you to feel overwhelmed again...so we'll save those teachings for other posts! If you live in the northern New Jersey area consider hosting a party OR I can bring a class to you and your friends-if interested, please e-mail me! Isn't this a neat idea? 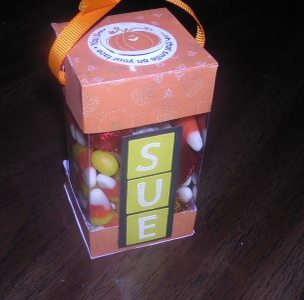 I originally learned about this adorable box from Susie McCormick who used it for Halloween Treats...I thought it was such a cute idea I decided to tweek it by adding the name of my hostess, and filled it with candy corn and seasonal Hershey's kisses-my October hostesses received this as one of their gifts for hosting an in-home party! (Hostesses can also opt to have their Stampin' Up! parties at my home Stamp Studio). I used a retired Stampin' Up! Designer Series paper from last season called Halloween Night for this particular acetate treat box because it had a really cute candy corn design, but you can easily subsitute any of the papers in the current Creepy Crawly DS Paper package or Pumpkin Pie Prints DS paper too and it would be just as adorable! I also used the cute stamps from the Batty for You stamp set and Pumpkin Pie Grosgrain ribbon, several circle and square punches and Short Order Alphabet letters..I basically used Sticky Strip as the main adhesive so it would hold together well. I love these DVD tins purchased online from Effectuality Inc so I created mine using Recollections Designer Series Paper! (Yes, these are my favorite! I am really hooked on these papers!!!) This was one of the projects I taught at my last Demo Class for my SOS Team downline demos in the fall...and they all loved it! What's great about these tins is they can be altered and used for SO MANY different things...this is not the last you will see of me using these! I love Stampin' Up! 's Monogram letters, and I thought these would look great on this tin to personalize them! The flowers are punched out using the Spring Bouquet Flower Punch to accent the Monogram, and various bows. 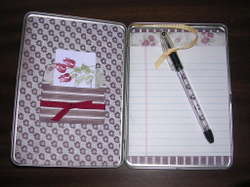 Twill Tape, Hodgepodge Hardware, the oval punch and letters punched out with the 1/4" circle punch make it easy to spell out a first name to further personalize the notepad tin cover. I intend to use the Recollections Papers when I organize my Stampin' Up! office, on everything from pen holders to file folders! DOUBLE THE PLEASURE-DOUBLE THE FUN! Mini Catalogs will be reduced from four to two a year: Holiday 2007 Mini Collection and Occasions 2008 Mini Collection! There will be TWO retiring lists offered each year! Although the Spring catalog will NOT have Fall/Winter sets in it, you will still be able to view them online and order them. IN Colors will remain the same in both catalogs, and will change annually. There will also be a Collections Preview Catalog showing what will be coming out in the new catalog! You'll enjoy twice the inspiration eac year, as EACH catalog will feature all-new samples, and hundreds more samples will at your fingertips! Sell-A-Bration will NOT be held in January-February 2008...but don't worry! The same promotion will be held, but at different times each year! I'm excited to offer fresh new stamps and accessories every six months now! If you haven't held a workshop yet in January, or attended one of my Sell-A-Bration Card Camps, Mystery Hostess Workshop (coming up this weekend) what are you waiting for? You can also host an ONLINE CATALOG PARTY with only $150 in purchases so tell your friends to check them out, choose a FREE Sell-A-Bration set with each $50 order, and earn yourself an extra FREE set when you collect $300 in orders...it couldn't be easier! To find out more contact me-I'll take care of the rest! I can only take USA orders...Canadians must go thru a Canandian demonstrator. Learn more by checking out the HOSTESS PROGRAM on my website. I love this Designer Paper! On Board Accent is the circle ("like no utter" cow is stamped on it). The bow is simple to do-simply apply strip of ribbon to background. Then tie a separate bow and attach to ribbon with mini glue dot!